In the week running up to the demo the main focus of the media was on how big it would be – with the implication (hope?) that a poor turnout would confirm claims by the government that opposition to water charges was weakening. However, these claims were convincingly refuted as up to 80,000 protesters, who had set off from three starting points around the city, converged on O’Connell Street. What was particularly impressive about the crowds was not just their numbers but the breadth of Irish society which they represented – from urban to rural, young and old, and from the poorest sections of the working class to elements of the middle class. It really had the appearance of a genuine mass movement. Indeed, it is the persistence of a mass opposition that made the latest demonstration possible. If it had been down to the trade union backed Right2Water campaign leadership the protests would have ceased when the legislation passed late last year. It was only when it became clear that the anti-water charges movement could continue without them that Right2Water, fearful of being sidelined, revived its support for protests. There is a tension between the movement and those groups which seek to give it leadership in terms of organisation. 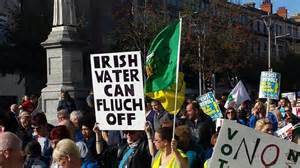 What was also clear from the demonstrations was that many of the protesters are in advance of the organisers in terms of demands – opposing not only water charges but also to the existence of Irish Water. So what did the speakers, who included trade union officials, community activists and representatives of the various left groups, have to say to the people? On first glance the range of opinions seemed quite diverse with expressions of support for non-payment and further protests and denunciations of the political system. However, the main thrust came from the trade union officials and the left groups, and their focus was entirely on next year’s general election. While the Socialist Party’s Ruth Coppinger did emphasise the need to build a non-payment campaign, it was placed within the framework of the election of a new government. This was made explicit in her claim that people could afford to not to pay as any penalties would not be imposed until next year “by which point there will be a new government”. Richard Boyd Barrett of the Socialist Workers Party/People Before Profit movement said that there would be more protests, but again this was linked the coming general election. It is clear that for the left groups the anti-water charges campaign – whether that takes the form of non-payment or protests – is seen through the prism of their own electoral prospects. Overriding all this is the trade union leaderships’ own strategy, which, after the collapse of the Labour Party, seeks to create a political vehicle that will look after the trade union interest. For the right of the bureaucracy this means cosying up to Sinn Fein, while for the “left” it means the construction of a broad front which not only encompasses Sinn Fein but also the left groups, various independents and the remnants of the Labour party. One speaker at the rally, clearly with such a coalition in mind, claimed that for the first time ever in the Irish state there was the prospect of a left government. While the construction of such a “broad left” is some way off tentative moves are under way to bring it about. One of these is the Right2Water campaign’s proposed declaration on the public ownership of water that will be presented at its forthcoming May Day Conference. The idea is to get as many parties and independents as possible to pledge themselves to it in order to give the semblance of a broad anti-austerity coalition. This “popular front”, which has long been advocated by “left” trade union officials such former Unite general secretary Mick O’Reilly and is now most identified with Brendan Ogle from the same union, has a number of serious shortcomings. The first is its view of Sinn Fein as a left party. While Sinn Fein may engage in some radical rhetoric the reality is that it is a bourgeois party committed to working within the framework of austerity – whether that is the Troika programme in the south or the Stormont House Agreement in the north. A coalition that has Sinn Fein as its leading component can’t be anti-austerity. The second short coming is the extremely minimal programme that would underpin such a coalition. Its vague anti-austerity message would be even weaker than the programme put forward by the now defunct United Left Alliance at the last general election. The appeal for the left groups of such a loose formation is that it allows them to sweep up a protest vote while keeping on side with the union bureaucracy. It also underlines the extent to which s minimal reformist programme has moved from being an opportunist manoeuvre to the actual programme of the groups. To describe this as a left unity project, never mind an alternative left government, would be a complete fraud. However, the fundamental flaw in this reformist strategy is the belief that the election of a left government – even one without the limitations described above – would make a difference. The experience of Syriza in Greece shows that this is not the case. The capitalist classes across Europe will not recognise any democratic choice against austerity. As the German finance minister has stated: “elections change nothing”. Despite the more militant rhetoric from the trade union leadership they are still essentially in lobbying mode – seeking no more than to have the ear of a party in government. Moreover, they are still fully committed to social partnership. This can be seen most clearly in relation to Irish Water. Despite their rhetorical opposition to water charges the trade union leaders played a key role in the creation of the new company by facilitating the transfer of workers from local councils. Opposition to this transfer could have prevented the establishment of Irish Water and stopped water charges and privatisation at their earliest stage. This was, and remains, potentially the most effective tactic to oppose water charges. Because the left groups have bound themselves to the trade union leadership its collusion in the imposition of austerity goes unchallenged. The idea of workers taking action by and for themselves doesn’t arise. All that remains are a series of tactics (protests, non-payment etc) designed to build up support for the “left” in the next year’s general election. As a strategy this is completely unconvincing. The strategic objective for socialists, as it has been for a long time, is to break the Irish working class from social partnership so it can regain its organisational and political independence. This is a precondition for any serious opposition movement to emerge. While the anti water charges movement is a long way from this it does signify an awakening within the Irish working class after a long period of retreat. There is now an audience that is receptive to stronger socialist arguments.